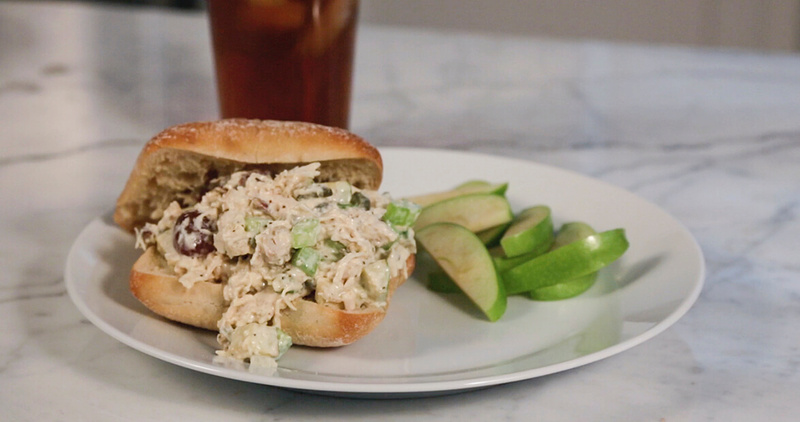 Apples, grapes, and toasted almonds add a delicious sweetness and crunch to this chicken salad recipe. This recipe originally appeared in the Hopewell Heritage Cookbook in 2012. Combine chicken and celery in a large mixing bowl. Combine remaining ingredients in a separate bowl, stirring well. Add ingredients to chicken mixture, and toss until well-incorporated. Cover and chill in refrigerator before serving with your favorite bread, condiments, and garnishes, or enjoying on its own.